This past weekend was an unusual one for me and my family. For the first time in what felt like close to forever, we didn’t have anything on the calendar. Instead, it was a weekend of taking our time, enjoying one another’s company, and pausing so we didn’t miss the nightly sun set. It was the kind of weekend that reminds me of all the wonderful gifts in my life, especially the four people in this universe who mean the most to me. And, since I’m a navel gazer in the extreme, I’m still thinking about how this past weekend made me feel. Or, if I am more precise, how having the luxury of time to appreciate my husband and kids has refilled my heart. It made me think about how connected they are to me, for now and for always. Of paste, yarn, and spray-painted macaroni-covered cigar boxes. Words that told me to believe in an after-life. Of chalk, books, and Bunsen burners flickering on low. But is not created nor can be destroyed. In feeling you all around me and not just in my arms. All of us are here only until we are back out there. Back among the stars and trees and the bulbs bursting from the soil. In knowing that you didn’t leave me. You only changed into something else. You are the wind in my hair, the sea spray on my face. The new born lamb and the blade of grass. And the stars that fill the night sky. Last week, a woman I know only via social media died after a long battle with cancer. She shared her story, the good parts and the hard parts, in order to help people better know not just her experiences with loss and cancer, but her hope that people be able to see the good even during difficult times. Lisa Bonchek Adams touched a lot of lives by sharing her story. I think she would encourage all of us to share more and hold back less. I know the people who held her dearly in their lives are hurting now and I hope they can find solace in whatever tradition is meaningful to them. My friend, the author Joy Hensley, reminded me of a practice I find to be very healing and helpful: Zentangling. My favorite thing about Zentangling is that it forces a rather Type-A person such as myself to let go of the need to be perfect and instead embrace life’s messiness. My Zentangles all start with pencil marks defining the piece’s edges, but are completely done in pen…a small reminder to commit. I’m never 100% pleased with any Zentangle I create, but I’m always glad that I’ve committed to the process. And I am reminded that I can always find something good in even the most disappointing experience. *I was thinking about Lisa’s circle of life when I sat down with my paper and pen this morning. This piece incorporates a star, a DNA-esque strand, hearts and a fern. 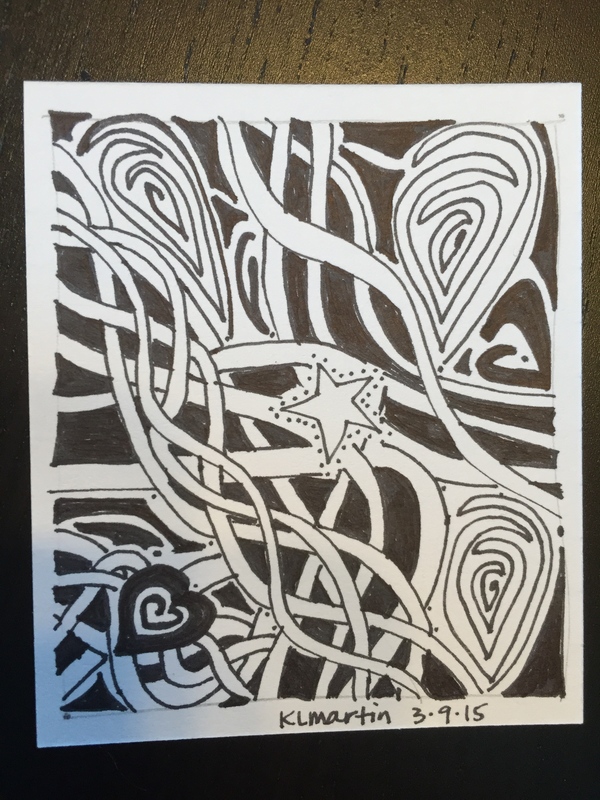 This entry was posted in family, Front Page, poetry and tagged family, Joy Hensley, Lisa Bonchek Adams, poetry, the circle of life, Zentangles by kristina. Bookmark the permalink. Boy, that can be tough one. Thanks for this Kristina. Today the something beautiful I find is you. Thanks for this, Kristina. That poem is so lovely.